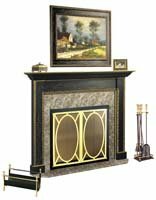 Handcrafted by Skilled Artisans, each mantel is available in two sizes. This simple three-piece unit features a unique interlocking design assembly. Each finish is proficiently hand-applied over natural first-quality wood Only the finest materials are used, including gold leaf and genuine sterling silver on appropriate models. Custom-cut matching picture frames and mirrors are available.